Finally, tethering on the iPhone. I am not looking forward to the end of that promotion as I'm sure Rogers will somehow figure out a way to gouge me out of more money. This may not apply to you, but to get the tethering to work I had to choose Advanced and then manually Renew my DHCP lease to contact the Rogers DNS and get on their network. 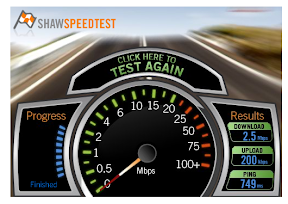 The speed I got using Shaw's speedtest was 2.5 MBit/s down and 200 kbps up at ~8.30 pm. If these speeds are consistent across Canada in 3G, I'm more than happy with this for emergency internet use.